At the World Health Assembly this year,GE Healthcare and Women in Global Health, a movement that strives for greater gender equality in global health leadership, are joining forces to honor and celebrate women in global health. Audra Renyi from Canada is being honored this year as a 2018 Heroine of Health for her work around hearing and hearing loss for children in low-income populations. 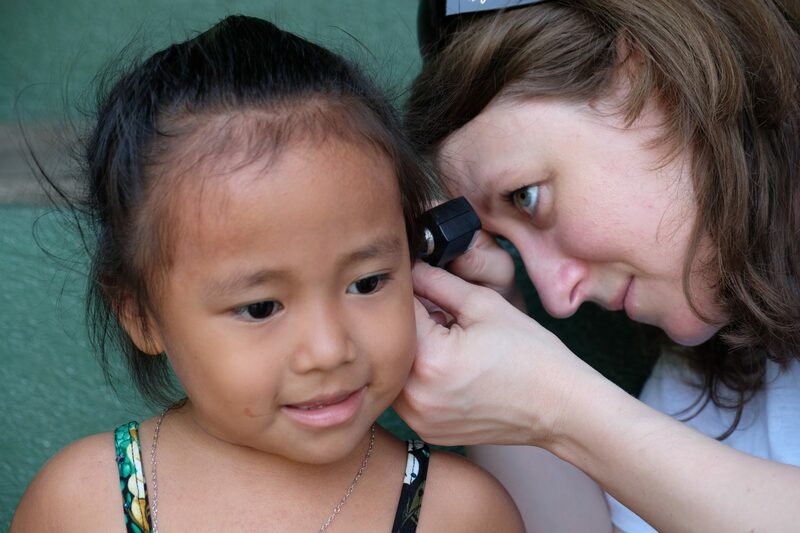 As a disability that affects nearly 466 million people, of whom 34 million are children, Audra’s organization earAccess has been helping provide an affordable solution to hearing loss and hearing aids for the world’s most remote communities. We sat down with Audra to hear more about her work and the personal inspiration behind her mission of better hearing for all. Audra, tell us more about the work that you do with your organization, earAccess. Audra: earAccess is a social enterprise that is disrupting the hearing aid industry, providing hearing services (testing for hearing loss and hearing aids) that are 70% cheaper than comparable options. Today, according to the World Health Organization, there are 466 million people with disabling hearing loss, but it is estimated that only 13 million hearing aid units are sold annually. A large barrier to access, especially to the most underprivileged populations, is cost. earAccess works with alternative distribution channels to ensure hearing care is more widely accessible, even in the world’s most remote settings. World Wide Hearing, our sister non-profit organization, focuses on providing hearing aids, primarily to children and youth, and serves the poorest, most marginalized populations. It does so by training local women to become hearing aid technicians and provide hearing care in their communities. Additionally, with the support of Google.org, World Wide Hearing is developing a teleaudiology platform to empower hearing aid technicians to better serve their communities. The organization also conducted the world’s first impact study to measure the positive outcomes of providing hearing aids in a lower-income country. Audra: My father and his sister grew up in Romania and when he was nine and she was seven, they developed an ear infection that impaired the auditory nerve in both their ears. Both my father and my aunt have been wearing hearing aids for decades, but it is not until I met Claudio Bussandri, the founding chairman of World Wide Hearing, that I realized that hearing loss was an invisible disability of major proportions. Unaddressed hearing loss can greatly limit a child’s speech and performance at school. For adults, it can greatly limit their potential to work and severely affect their mental health, leading to depression and cognitive decline. Amplification, i.e. hearing aids, can benefit 95 percent of people suffering from hearing loss, so the good news is that the solution already exists. The problem is distribution and how you get these hearing aids to the people who need them most. My goal is to ensure that every person with hearing loss, no matter how poor, can reach his or her full potential. Can you share a story that solidified why you got into this line of work? Audra: As a young child, it was the moment I realized my father needed his hearing aids to hear me, and so did my aunt, his sister. That has remained with me my whole life, the knowledge that without hearing aids they would be completely isolated. When was a time you felt like you were holding back your own voice and how did you overcome it? Audra: Until I found my vocation, hearing health, I felt that I was turning around in a circle all the time, even though I was achieving things. When I met Claudio Bussandri, he asked me whether I would be willing to help him launch an NGO, World Wide Hearing, that would help poor children, in particular, receive hearing aids. I didn’t know it right then, but I had found a cause worth living for. 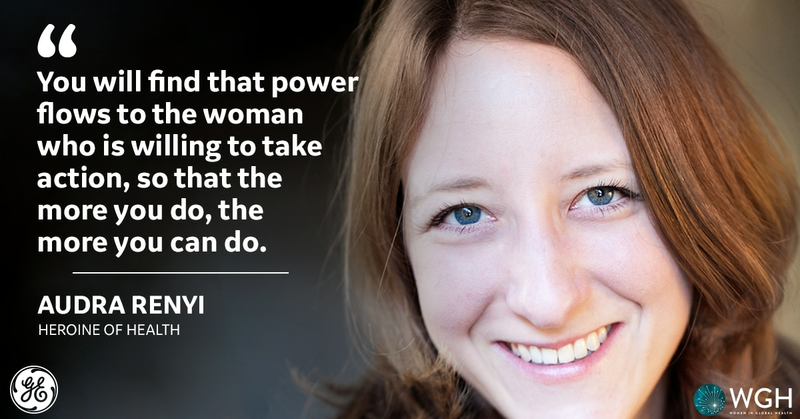 What advice do you have for the next generation of young women in global health? Claire: Make sure you do things for the right reasons – if you feel passionately about something then stop and think how can you affect change – how can your voice be heard. Don’t accept things because this is how it is always done – challenge and ask how can we do this better? Stand up for what your core beliefs are and know that everyone has the ability to make a change. Be that person. Audra is one of nine women being recognized at this year’s World Health Assembly as part of the Heroines of Health honors. Learn more about this year’s Heroines of Health here.